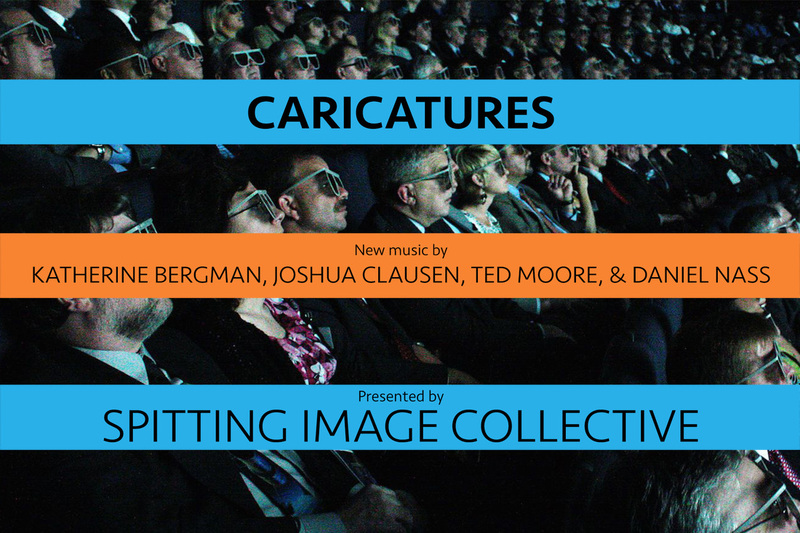 May 13 & 15, 7:30 p.m.
From a befuddled philosopher to the queen of the underworld, Spitting Image Collective presents music that parodies a collection of colorful personalities from both fiction and reality. Featuring new music by Katherine Bergman, Joshua Clausen, Ted Moore, and Daniel Nass, and performances by Nexus Duo, Caprice Saxophone Quartet, Jeffery Kyle Hutchins, Joshua Weinberg, Sarah Porwoll-Lee, and Stan Rothrock. Spitting Image Collective presents Caricatures from Spitting Image Collective on Vimeo. Samples of poets, artists and people with popular YouTube channels form the basis of this piece, which was composed for the Renegade Ensemble for their performance at the Minnesota Fringe Festival. Though the piece is for open instrumentation, there are two versions available: one is a duo, and the other builds on that duo with parts for four percussion players. Movies aren't like real life. Events in real life couldn't be as perfectly calibrated and symbolic as the things that happen in our entertainments. Although today when real life's events are framed, disseminated and given their cultural context instantly, mostly by private companies and/or millions of people en masse, those "real" stories do start to feel more like movies, right? Like they didn't just occur and exist, apart from us; like instead, they exist because they were imagined and arranged? ​Somewhat tongue-in-cheek (but with a bit of genuine concern), Alone Together takes a look at the social and psychological effects of technology. As we become more and more reliant on electronic devices and social networking tools, our real-world lives and relationships offline can suffer. In the office, in social situations, and even at the dinner table, we might be gathered in a room together, but we’re often tethered to our devices, engaged in other activity. We’re in a semi-alone state—we’re alone, together. ​Nostalgium is the third movement of Persephone, an hour long work for piano, saxophone, viola, and percussion. Persephonewas created in collaboration with choreographer Hannah K. Holman and premiered with live dance at the Cowles Center for Dance TEK Box in December 2014. This movement portrays the Greek mythological character Persephone’s longing for home and order after she sought out chaos in the form of an adventure to the underworld. Persephone is not yet sure if she should regret leaving home, as she doesn’t yet see the creative potential in her new unknown. My earliest introduction to ‘classical music’ came as a young man learning to play the piano. And what I loved to play most were simplified versions of the ragtime music of Scott Joplin.Regrettably, I gave up piano lessons by the age of 12, but my early love for ragtime remains strong. When an opportunity arose to write some piano music for a friend, I decided to try my hand at some rags of my own. Three K² Rags was written for, and dedicated to, my good friend, Kyle Kindred. A few years back, I was having drinks alone at a bar, and eventually I found myself chatting with a stranger about music, art, and life. After an hour or two of conversation, the man said to me, “You know what my philosophy is? 'Is always be. '” When I asked him to explain, he only repeated, “is… always… be.” I still don’t know what he meant by it, but I liked the sound of the phrase, and kept it in my brain to be used as the title of a future piece.